Job Growth Highest in Low Wage Industries. As part of a larger research project being coordinated by the Canadian Center for Policy Alternatives, entitled Working Across Canada, I have been volunteering my time researching various dimensions of labour markets in Canada with the intention of creating a new measure to evaluate the nature of employment quality- or as some call it at the International Labour Organization and elsewhere – a Good Jobs Index (I am not sure what to call it). As I work through this project I thought it would be constructive to write up some of the more interesting findings that are uncovered along the way. I also thought it might be constructive to evaluate some new web based software that allow users to interact and explore data in which was loaded up for this project. This interactive aspect will hopefully allow readers a chance to dig deeper into the research and explore the data, slicing, dicing, rolling up and segmenting with ease and adventure. Just click on the included link below to interact with the data chart. (you can use the software online CLICK HERE, or you can download the reader here and use it offline.) Mainly I want to bring light to some of the data artifacts that are uncovered and try and fit some reasoning and limited analysis to the facts. Employment, or having access to a means of the production is the key to a person’s survival and well-being within a market based economy. For women in many developed nations, the past thirty years have served as an unprecedented period of entry into the waged workforce of the formal economy. It has been heralded by some as the great exodus out of the chains of the informal economy into the “freedom” of the waged workforce- as one artist famously put it in the ‘70s, moving away from “being a slave of a slave”. Examining chart 1 and comparing the employment rate of women over the past thirty years verifies that this transformation has been ongoing in a substantive and hurried process. Only briefly interrupted by two recessions the upwards rate of women workers into the formal economy marched steadily onward from less than 50% in the 70’s to an employment rate that has women workers now approaching that of men. 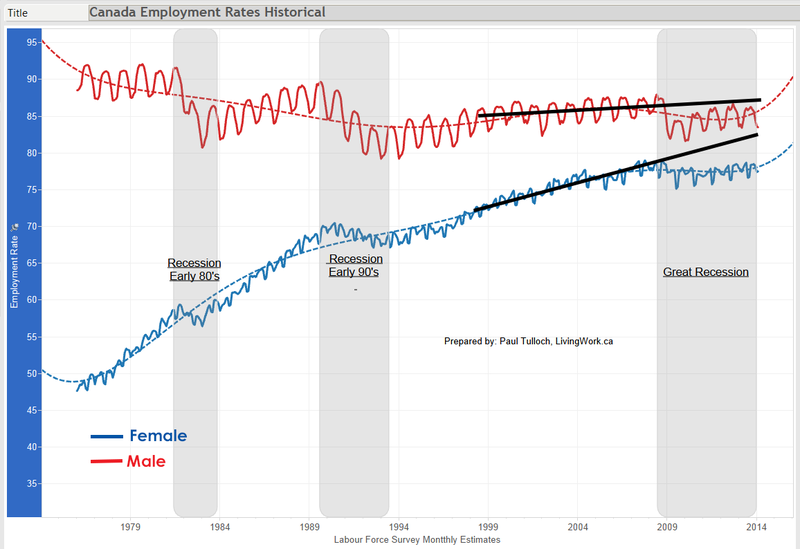 After nearly thirty years of steady and consistent employment rate growth, the great recession of 2008 ravaged the economy and the velocity of change in women employment rates for prime age women aged 25-54, came to a very sudden halt. Upon hitting the employment wall- the rate has stalled for the last 6 years at a historic (non-war time) high of 77%. These past six years of stagnation has been the longest period of non- growth in the employment rate of women in more than 30 years. As we move through this unprecedented period, the question must be asked- are we witnessing a historical maximum for women’s employment in the Canadian workforce? Have we reached an upper bound of women workers in waged work? The debate of who lost more, is of course a loaded question chalk full of the political dimensions of bias and would simply result in the divide and conquer mentality. So rather than focus on a gender divisive debate, given the numbers, one can conclude both genders have suffered greatly but differently. As can be seen in chart 1 women’s employment rate has been growing at a much higher rate over the past 30 years than men, as women entered into the waged workforce in droves. The employment rate for men on the other hand has slowly declined over this period in a very awkward but evidently painful recession induced jagged downward trend. Each of the three major recessions over the past thirty years has been quite painful for both genders but for men it has meant a permanent adjustment to a lack of waged work for an increasingly larger proportion of the workforce. Starting in the 70’s the employment rate of prime aged males was averaging above 91% – then after a massive carnage of job loss in the early 80’s recession due to high interest rates and the beginning of the neo-con assault on workers, recovered to stabilize around 87% for much of the 80’s. After which the early 90’s recession took its toll and again male workers dropped off and recovered to stabilize at a lower 85% employment rate. Facing the great recession of 2008, males were hit quite suddenly with substantive jobless and they seem to have recovered ever so slightly to stabilize again at a lower rate at 83%. Obviously, given these are prime aged workers, many have to adjust to life without employment, as either discouraged workers or in some other activity (training, house husbands, return to school, early retirement). The focal point for men has been a three decade long adjustment to a lower and lower equilibrium of life without waged work. Considering this 30 year linear climb for women, the velocity and scale of such growth over is historic and an impressive display of the market’s ability to find such space for waged workers during a neo-liberal era of uneven economic growth. Recall in retrospect that we are witnessing an almost doubling of the labour force for women in just 30 years- yet we have still maintained an unemployment rate of below ten percent (outside of the recessions and depending on how you measure unemployment). Of course as impressive as that sounds it says very little about the quality of a high proportion of jobs that were and continue to be created for women- more on that in another paper. Since the end of the early 90’s recession, women have been entering into waged work at somewhat slower velocity then previous periods, however the acceleration is still positive and consistent up until the great recession hit in 2008 and then it flat lined. So the logic is clearly evident, we are either at a maximum of women’s grand entry into employment- or alternatively women have suffered massive loss of forgone jobs through the recession. This does not mean women actually lost all 400,0000 jobs, as in the case of men who actually did experience plenty of job loss, but it does mean that for women the pain of the recession was in terms of lost actual and potential jobs and was differently realized then men. That is women, were not hired, but most likely would have been, given the strength of the underlying historical trend in growth of women’s employment. And that loss actually does count as a dead weight loss to society given the strength of the relationship prior to the slowdown. In summary, we need to be mindful that lost opportunities must be factored into the damage the recession unleashed. Oddly enough if we look at the participation rate of women it is does not quite reflect this notion, in terms of proportion, or fluidity. As one would have expected a large increase in unemployment to match this employment flattening trend. However unemployment falls short of that which we would have expected and is only partially made up for in the pattern that was witnessed in the participation rate. So what does that mean- it means a whole lot of women workers either left the labour market in discouragement or indeed we have reached the height of women’s entry into the workforce? It is actually a very odd finding given the timing. 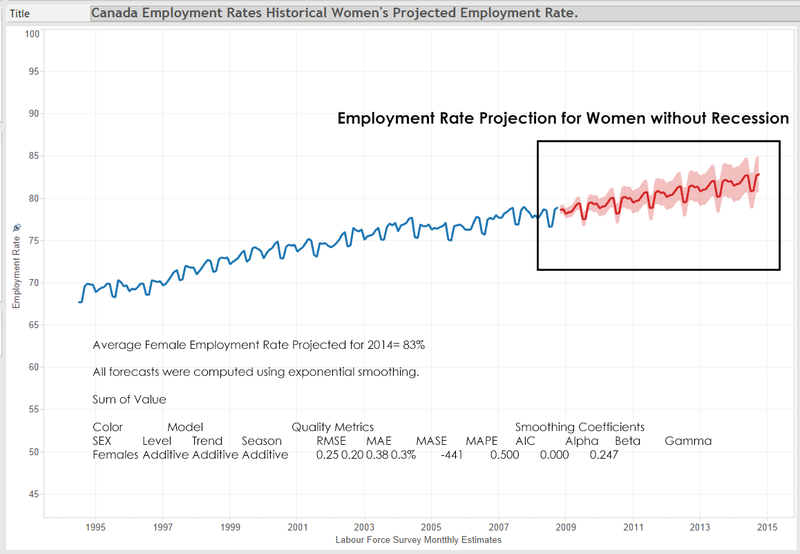 Given the ongoing stagnation in the economy and recessionary winds it would be premature to say that women’s historical employment rate has peaked at 77%, a full five plus points below men. So that begs the question should we expect a difference between women and men employment rates? Is there some systemic discriminatory disincentive to waged work operating independently or dependently on gender to explain such a difference? One could suggest differences in job quality, pay rates, precarious work, career opportunity, and/or unwaged labour demands are all undoubtedly some factors. You can explore the data yourself. Have a look and compare different age groups, participation rates, or other aspects of the labour force and see how these measures reacted in previous recessions. Of course the employment rate is different from that of the participation rate that is often used to measure waged workers participation into the workforce. Employment rate includes discouraged workers who fall into the numerator. Also recall that we are referring to relative increases, and as the population increases we will see more women enter into employment, but given the flatness over the past six years means that employment for women is constant with the total amount of people employed. This is indeed a very big question and only the future holds clarity for outcomes, but if this current employment rate of 77% is to become a permanent fixture of the labour market for women and we have reached a maximum, then it will unleash some very massive changes in other areas of the labour market and society. All of which have been affected by the almost constant rate of increase in women’s commodification into the waged labour of the market, and the dynamics that are intricately woven through the fabric of society. It will mean a lot of change on many other connected issues, and will have a significant slowdown in everything from day care to food items in the grocery store. We have become so accustomed to this large ongoing change of the women into employment, that without that growth much will have to adjust to the relative stability of natural population growth. If we are not at this point, then we must reconsider and rewrite that the recession had a massive impact on the employment loss for women workers, and rather than being the “he-cession” that many labelled this last recession- it will mean over 400,000 jobs will have been lost by women workers- as that is what the trend would have predicted. Report Shows Job Growth Highest in Low Wage Industries. Employment Insurance Levels on the Rise- this is more than a “technical recession”! Help LivingWork.ca Produce More Outstanding Progressive Research and Data Analysis- Donate now.